After moving into my new apartment I realized I didn’t have any potholders (something as a lover of baking I couldn’t live without). I knew that I had some at one point that my mother had made, but I couldn’t find them in any of the boxes I had initially brought with me. So I decided that I would make myself some. I figured it would be a quick weekend job. I mentally went over my stash of cotton yarn, eyed the Michael’s ad, and then did something I really shouldn’t have. I went and bought some new yarn even though I had decided that I was going to work through the yarn I had before buying anything new. The only justifications I can give are that the yarn was under a dollar a skein and that I was going to use it right away. All of which meant I spent less than $4 on the four Lily Sugar’n Cream skeins of cotton yarn and that I would be making that initial chain right way. And to be honest, I also wanted to use colors that I would enjoy for years to come. So I ended up with Warm Brown and Red. If the store had had more than two skeins of the Warm Brown in the same dye lot, I probably would have bought enough to make a couple dishcloths, placemats, coasters and so on. 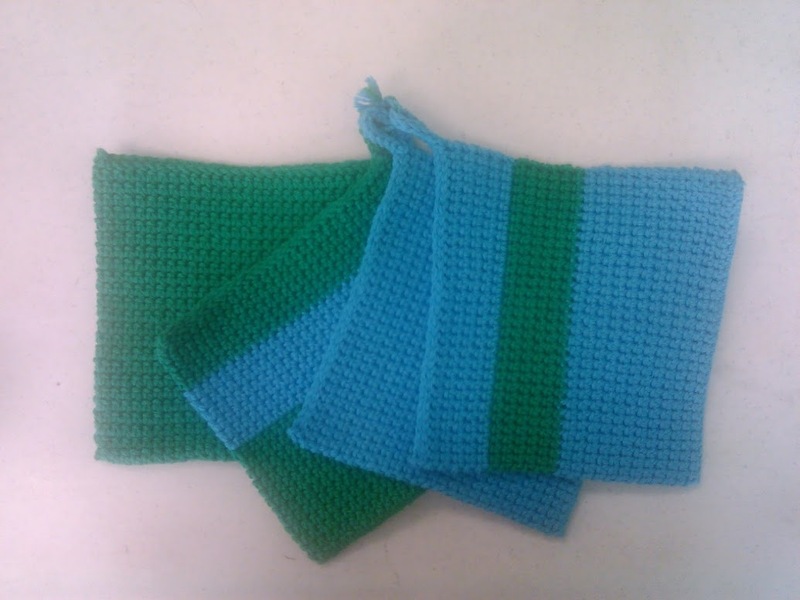 Although the only things I’d probably end up actually using would be the dishcloths and potholders. So, the day after acquiring the new yarn I set to work. My quick weekend project ended up turning into a three month ordeal. Having only recently gotten back into crocheting, my hands weren’t quite up to the task. I finished two within a week, but the last two took quite a bit longer. I also visited my mother, found a box I had missed which contained the four potholders she had given me in college, and then I found out one of my friends and his wife were moving into a new place. So, being as I actually wanted to use up my stash, I brought over all the other Lily Sugar’n Cream yarn I had and let them pick their colors. It took me about a three weeks to finish off their potholders. But I had a nice deadline to push for, so I didn’t dally as much as I had been with mine after finding my old potholders. I was also happy to find that this new set of potholders was a much more consistent size then the two I had made for myself so far. And it meant that I now had 4 less skeins of yarn in my stash. They are also the second gift I’ve made from my yarn stash since the beginning of the year. I eventually did end up returning to my own potholders after I found out about the knitting and crochet group meeting twice a month at the yarn shop near my new apartment. I’m happy to say that I finished them, love the colors and was able to show them off at my birthday party over the weekend. And now I really wish that I could have bought more of those two colors so that I could deck out my kitchen in these beautiful colors. If you are interested in making your own potholders, I mainly followed Miss Abigail’s pattern, but I used the starting chain of 31 since I wanted a slightly larger potholder. These potholders are extra thick as you are crocheting through a loop from the current row and the previous row.